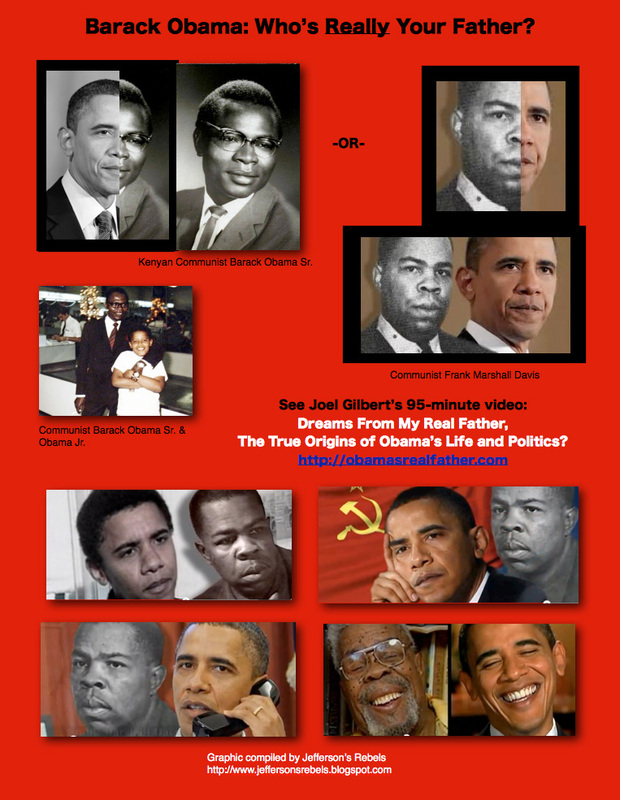 A month ago I watched Dreams From My Real Father and was shocked that Obama resembles his Hawaiian neighbourhood communist mentor Frank Marshall Davis far more than he does his supposed Kenyan father. That's a big topic, so I'll leave that for another time. But meanwhile, Obama's alleged half-brother Malik Obama was recently interviewed by Joel Gilbert (who sent Malik a copy of Dreams From My Real Father). Malik is disillusioned by Obama's disinterest in his Kenyan family and now even questions whether Obama is a blood relative. Malik said that Obama resembles Frank Marshall Davis and doesn't look like Obama Snr. JG: So, do you think that Barack looks like Frank Marshall Davis - this is a man that he said raised him - more than your father? MO: There’s a great resemblance. I think Frank Marshall Davis and Barack, they look alike. Some kind of moles I see on his face and Frank, he has those too. There’s a resemblance. JG: And does he resemble your father? MO: Not really, I don’t. They talk, they say about the years [ears? ], but no. No. Your movie definitely puts a lot of questions in my mind. JG: Well would you like to see or do a DNA test one day to know for sure? MO: That would really prove whether we are related or not. Yes. I would be willing to do that. I don’t know how I’d deal with it, if it really came out that he really is a fraud or a con. JG: It might be the reason why he made such a big deal about you politically, but personally he doesn’t feel the bond. MO: I’m agreeing. Yeah, I agree with that because it’s hard to understand how somebody can make such an about turn and make a big play about where he comes from and then once he gets what he gets, wants nothing to do with that place anymore. We need an explanation and if you can provide the explanation, it would be better for all of us so we won’t be hanging, hoping for nothing. That’s what I really feel for my people is ‘cause they keep hoping. Maybe they’re hoping for nothing. Cause he doesn’t mention it any more where he comes from or who his relatives are. He doesn’t say any of those things any more. It’s really disappointing, Joel, but that’s life. We live with it and move on and we wait for the truth to come out. File under: the undocumented president.